How to represent a set using Venn diagrams in different situations? 1. ξ is a universal set and A is a subset of the universal set. • Draw a rectangle which represents the universal set. • Draw a circle inside the rectangle which represents A. • Write the elements of A inside the circle. • Write the leftover elements in ξ that is outside the circle but inside the rectangle. • Draw two circles inside the rectangle which represents A and B. • The circles do not overlap. 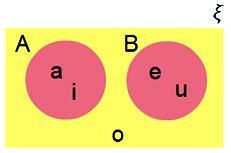 • Write the elements of A inside the circle A and the elements of B inside the circle B of ξ. • Write the leftover elements in ξ , i.e., outside both circles but inside the rectangle. 3. ξ is a universal set. A and B are subsets of ξ. They are also overlapping sets. • Draw a rectangle which represents a universal set. • Write the elements of A and B in the respective circles such that common elements are written in overlapping portion (2, 5). • Write rest of the elements in the rectangle but outside the two circles. 4. ξ is a universal set and A and B are two sets such that A is a subset of B and B is a subset of ξ. • Draw two circles such that circle A is inside circle B as A ⊆ B. • Write the elements of A in the innermost circle. • Write the remaining elements of B outside the circle A but inside the circle B. • The leftover elements of are written inside the rectangle but outside the two circles. Observe the Venn diagrams. The shaded portion represents the following sets. 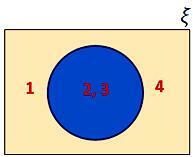 Use Venn diagrams in different situations to find the following sets.